These bites are perfect for something healthy to grab while on the go — whether it be at work, school, or the great outdoors. I’m always looking for portable snacks and treats to help keep us going a little longer, whether at school, work, travel, or play. Here’s a light, sweet, gluten-free snack that’s easy to pack. 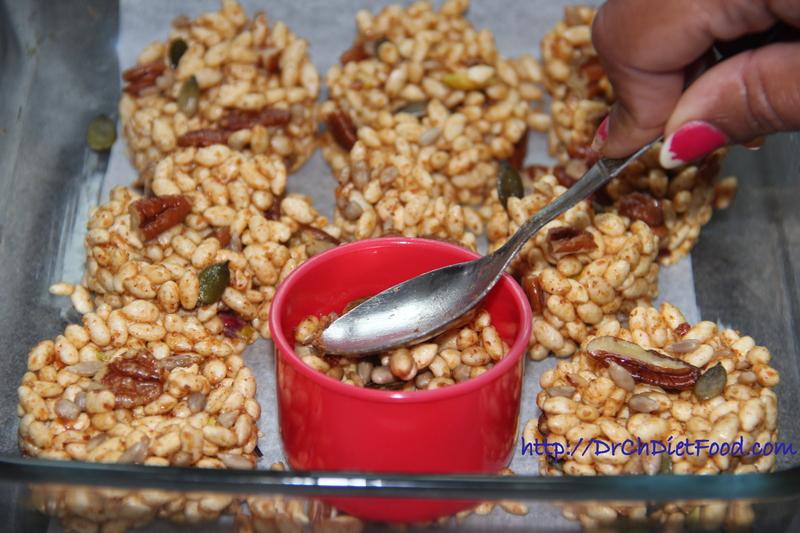 If you like breakfast bars that are made of light, puffed rice and other gluten-free grains, this recipe is for you. Almonds, pistachio (can be easily substituted with peanuts or cashews or any nuts and seeds of choice), raw pumpkin seeds, puffed brown rice, sunflower seeds, chai seeds. Line 8×8 baking dish with a parchment paper/baking sheet-grease and set aside. 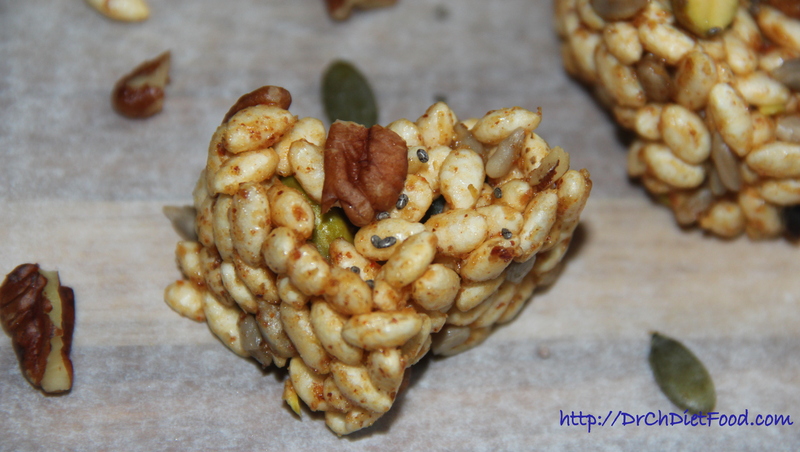 Combine puffed rice, chia seeds, sunflower seeds, almonds, pistachio, pumpkin seeds in a mixing bowl and set aside. Heat olive spread, maple syrup on a medium-high flame in a small saucepan, stir in almond butter, rock salt, chilli powder and keep stirring for 1-2minutes. Turn off the flame and pour this mixture to the puffed rice mixture and mix thoroughly. Transfer this mixture to the lined and greased baking dish press firmly using a spatula or a spoon and spread evenly. Once cooled completely- cover with the foil/cling film and let it set for 2-3hours. Once set cut into desired shape prior serving. Alternatively any olive oil, vegetable oil, coconut oil or any vegan spread can also be used instead of coconut oil. Nuts and seeds proportion and combination can be personalised as per the taste. Posted on March 15, 2015, in Appetizers, Breakfast, Breakfast, Indian, International, Sweets and tagged Breakfast healthy bars, Gluten free Healthy Snacks, Kids recipes. Bookmark the permalink. 38 Comments. an excellent lunchbox treat – I love pumpkin seeds. This is an excellent substitute for store bought granola bars that usually have refined sugars and extra sodium. Chitra has many such healthy recipes, and thanks to her for this one. Thank you dear… long time… Howz you? Hope all is well? Hello Chitra, These took me down memory lane. I was reminded of the Puffed rice and Jaggery laddoos that my mom would bring home from the local market during my childhood. Nice and interesting posts I get to see here. Thanks. This treat looks delicious! I would use the coconut oil too. I like the hint of sweetness that it has. I have to try this one.. looks so perfect.. Thank you so much…Await to hear from you.. Yes dear…Mum used to make them…. yum–I like how you have the sweet and spicy here! Looks awesome Chitra! yum yum!